“Pedigree indicates what the animal should be. “Breeding to the standard will not preserve function. 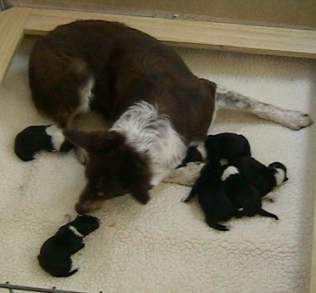 We take breeding very seriously, and believe that the ONLY reason to breed a Border Collie is to improve, or at least maintain, a very high level of working ability in the resulting pups. We do not believe anyone should breed a Border Collie unless it is a very good herding dog. We only breed when we are ready to add a new working partner for Chuck and me. That means we only produce a litter once every four years or so. We take full responsibility for the pups we produce. Any pup that is sold that cannot be kept by the new owner for any reason will be taken back by us – at any time during the dog’s life. We screen our buyers very carefully so that the likelihood of a pup being returned is a lot less. So, if you contact us for a pup, and you get the third degree, please don’t be offended, we only have the best interest of our pups at heart.